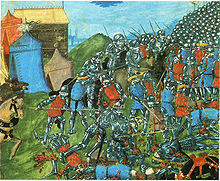 Depiction of the battle, c. 1335. The Battle of Vouillé (from Latin Campus Vogladensis) — was fought in the northern marches of Visigothic territory, at Vouillé near Poitiers (Gaul), in the spring of 507 between the Franks commanded by Clovis and the Visigoths commanded by Alaric II. 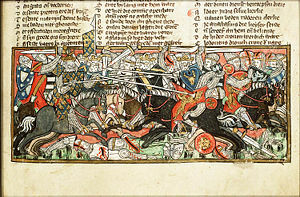 Clovis killing Alaric II at the Battle of Vouillé, 15th century miniature. Clovis' army was slowed by a rain-swollen Vienne river, yet his forces were able to engage the Visigoths south of Vouillé. With his missile troops stationed at the rear of his army, Clovis sent the rest of the army forward to fight hand-to-hand with the Visigoths. During the melée Clovis allegedly killed the Visigothic king Alaric, whereupon the Visigothic army broke and fled. After Clovis' success in this battle, the Byzantine emperor Anastasius made him an honorary consul and patrician. The battle forced the Visigoths to retreat to Septimania, which they continued to hold, while the success at Vouillé allowed the Franks to control the southwestern part of France and capture Toulouse. Alaric's illegitimate son Gesalec tried to organize a counterstrike at Narbonne, but he was deposed and ultimately killed when Narbonne was taken by Burgundian allies of the Franks. ^ Encyclopedia of Barbarian Europe: Society in Transformation, ed. Michael Frassetto, (ABC-CLIO, 2003), 362. 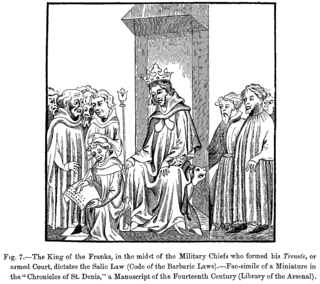 ^ Clovis, Anastasius, and the Political Status 508 CE: The Frankis Aftermath of the Battle of Vouillé, Ralph W. Mathisen, The Battle of Vouillé, 507 CE: Where France Began, ed. Ralph W. Mathisen and Danuta Shanzer, (Walter de Gruyter Inc., 2012), 88. Bernard S. Bachrach, Merovingian Military Organization, 481-751, University of Minnesota Press, 1972. Encyclopedia of Barbarian Europe: Society in Transformation, ed.Michael Frassetto, ABC-CLIO, 2003. Eugen Ewig: Die Merowinger und das Frankenreich, Stuttgart u.a. 1993. Herwig Wolfram: Die Goten, München 2001. Vouillé is a commune in the Vienne department in the Nouvelle-Aquitaine region in western France. Inhabitants are known in French as Vouglaisiens. Apollinaris was a count of Auvergne who led a auvergnat army for the Visigoths in the Battle of Vouillé, and was bishop of Clermont for four months before his death.